At the beginning of The Year My Mother Died, Sherry Scott reflects on her relationship with her late best friend Gail: “We were in a yellow Monte Carlo coupe with a brown rear-quarter vinyl roof, an early ‘70s model that had seen better days. Running late and finding ourselves in the wrong lane, we were held up at an intersection by a Dallas police officer directing traffic in all four directions.” Gail sticks her head out the window and asks if they make a left turn from the far right lane. “Without a moment’s hesitation,” Scott writes, “the cop—honest to God—blew his whistle, stopped all lanes of traffic, and waved us through!” The humor and appreciation captured in this small moment repeats throughout this book. Though a palliative-care pediatrician by trade, Scott was unprepared for her own mother’s death. In the months after her mother’s passing, she finds herself nostalgic and restless, experiencing both the comic and tragic at the same time. She becomes obsessed, for example, with her favorite rock star from her teen years, wishing she could go back in time and achieve as much as he had. This longing for achievement, of course, is really her way of longing for youth and immortality. Such honest self-reflection is the best part of the book, which is organized into chapters for each month following the death of Scott’s mother, beginning in October. 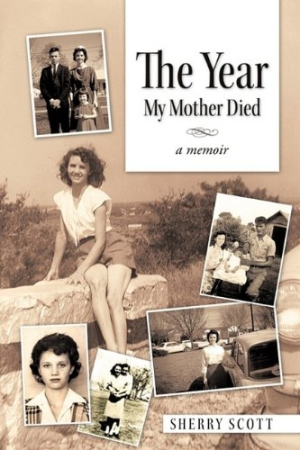 The Year My Mother Died does not loudly deal with larger-than-life events as so many memoirs do. It is a calm, reflective account of a life well-lived. Its setting is the quiet suburbs of Paris, Texas, which adds a flavor that is at once unique and familiar. The effect is enhanced by lovely black-and-white family photographs that appear throughout. Though an elegant portrait of the unique paths grief takes, The Year My Mother Died is a bit haphazard—it frequently meanders from one event to another, jumping forward and backward in time, with little logic or transition in between. Often, the reader has little idea which of Scott’s experiences are connected to her mother’s passing and which are related to other parts of the author’s life. Though she writes well, Scott often employs too much summary. One wishes she would zoom in and explore a moment more deeply than she does. Despite the title of the book, Scott’s mother remains elusive and largely unexplored. She figures as the catalyst for Scott’s own remembrances and existential explorations. Scott’s account of the year after her mother’s death provides insight into a mind both shaped and inspired by grief. The Year My Mother Died is sure to provide some comfort to those going through their own loss.